When writer/director Todd Phillips’ modern classic comedy, The Hangover, raked in an impressive $467 million worldwide back in 2009, a sequel seemed inevitable. As one of the many fans of the first, I thought The Hangover Part II seemed like a cash grab– a darker, less funny and more dangerous mad lib of its predecessor. Criticism aside, the fan base garnered by the first film carried the sequel to even higher box office success, taking in a whopping $586 million worldwide, making the first two films the highest grossing R-rated comedies of all time. So when the grand finale to the trilogy was announced, expectations could not have been higher. I’m proud to report that not only is The Hangover Part III a fitting conclusion, but it also gives credence to Part II and could very well be the best-written of them all. Following the drug-fueled nightmare in Bangkok, Part III picks up with a more somber and responsible Wolfpack. After their respective near-death experiences, Phil (Bradley Cooper), Stu (Ed Helms), and Doug (Justin Bartha) have resigned themselves to lives of normalcy, trying desperately to put the days of missing teeth, transvestites, stolen babies, and Mike Tyson tattoos behind them; all but Alan (Zach Galifianakis), who relishes in the memories on a daily basis, still eager to relive any adventure with his best friends. Following the accidental death of Alan’s new pet giraffe and the numb reaction to his father’s passing, the Wolfpack uses their leverage to get Alan to agree to rehab for his sociopathic behavior. On the drive to the clinic, the friends are abducted by Marshall (John Goodman), a gangster who tasks them with finding Leslie Chow (Ken Jeong), the Wolfpack’s involuntary partner-in-crime, who swindled millions of dollars from Marshall a few years back. The guys have 48 hours to locate and deliver Chow before Marshall kills Doug, thus setting the stage for a high-octane heist caper that is bigger than the previous two films combined. The first Hangover was a hilariously wild ride where the comedy stemmed from the chemistry of its cast. Part II had sacrificed levity for a more realistic reaction to the dangerous proceedings, shoehorning the occasional one-liner to remind its audience that they should be laughing. The Hangover Part III succeeds where Part II fails by letting the comedy organically flow from the action without deflating the dangerous undercurrent lurking just below the surface of every scene. This allows the characters to become identifiable while remaining hyper real; a true feat, especially for Zach Galifianakis’ Alan, who is no doubt the central character of the film. Alan is a fully realized man-child maturing before our eyes in Part III, and Galifianakis skillfully balances juvenile mischief with the heartwarming, offbeat sincerity that had us rooting for him in the first film. Bradley Cooper and Ed Helms provide commendable support for Alan’s hijinks, and despite not having as large of a character arc to traverse in Part III, they play their parts in a fully developed fashion. What’s most impressive though, is how well Todd Phillips was able to cleverly incorporate elements from the previous films into the plot without force-feeding or winking at the audience. As the trilogy comes to an end, one can tell that Phillips loves these characters every bit as much as the fans do, and he takes great care with the writing and direction to ensure that The Hangover Part III is an appropriate send-off and not simply a cash cow retread (in fact, the Wolfpack isn’t even hung over in this one). Sure, the movie has its faults—there are moments that feel like they were written for the trailer, and Chow is increasingly annoying as the film wears on—but overall, The Hangover Part III is all you can ask from the culmination of the franchise: hilarious, perilous, outrageous, and heartfelt. 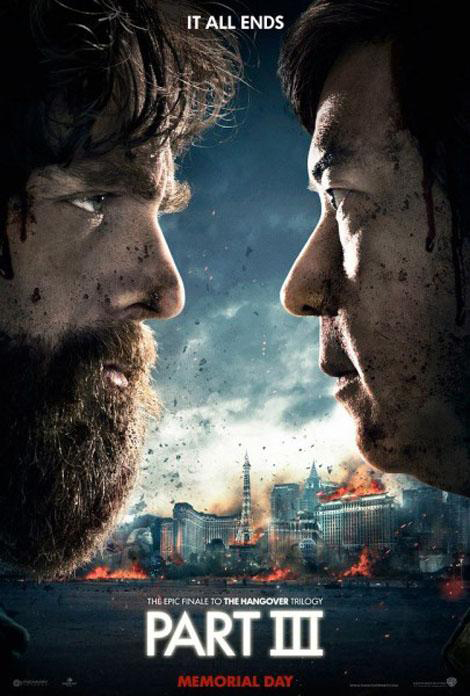 The Hangover Part III is now showing in Philly area theaters. « What’s After Cinema 16:9?